Reckless, who served during some of the bloodiest fighting of the Korean War, has been posthumously decorated for bravery ! In the U.S., the war was initially described by President Harry S. Truman as a "police action" as it was an undeclared military action, conducted under the auspices of the United Nations. In South Korea, reference was "625" reflecting the date of its commencement on 25 June. It is the bloody Korean War that began when North Korea invaded South Korea. The United Nations, with the United States as the principal force, came to the aid of South Korea. China, with assistance from the Soviet Union, came to the aid of North Korea. The war arose from the division of Korea at the end of World War II and from the global tensions of the Cold War that developed immediately afterwards. Korea was ruled by Japan from 1910 until the closing days of World War II. In August 1945, the Soviet Union declared war on Japan, as a result of an agreement with the United States, and liberated Korea north of the 38th parallel. U.S. forces subsequently moved into the south. By 1948, as a product of the Cold War between the Soviet Union and the United States, Korea was split in to two separate governments. Both governments claimed to be the legitimate government of Korea, and neither side accepted the border as permanent. The civil war escalated into open warfare when North Korean forces—supported by the Soviet Union and China—moved to the south to unite the country on 25 June 1950. There were to be dramatic reversals of fortune, which saw Seoul change hands four times, the last two years of conflict became a war of attrition, with the front line close to the 38th parallel. The war in the air, however, was never a stalemate. North Korea was subject to a massive bombing campaign. Years later, the fighting ended on 27 July 1953, when an armistice was signed after thousands of deaths. Away in United Kingdom, the Victoria Cross (VC) is the highest award of the honours system. It is awarded for gallantry "in the face of the enemy" to members of the British armed forces. It may be awarded posthumously. It was previously awarded to Commonwealth countries, most of which have established their own honours systems and no longer recommend British honours. Since the first awards were presented by Queen Victoria in 1857, two thirds of all awards have been personally presented by the British monarch. These investitures are usually held at Buckingham Palace. The award was instituted in 1856 by Queen Victoria to honour acts of valour during the Crimean War. Owing to its rarity, the VC is highly prized and the medal has fetched over £400,000 at auction. 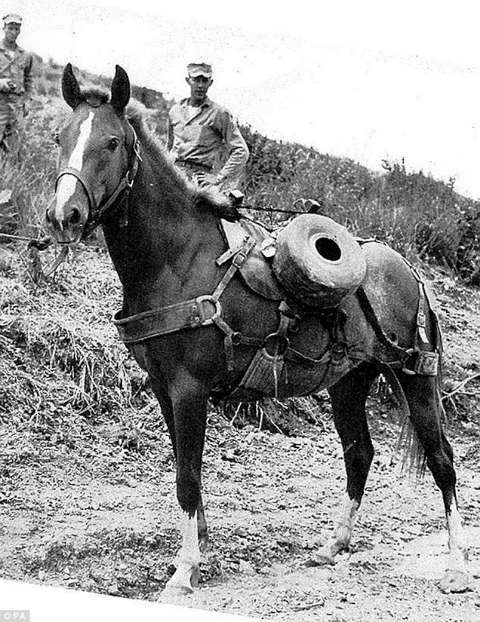 Now in news, is a war horse that carried 9,000lb of supplies and walked more than 35 miles in a single day in Korea, awarded the animal version of the Victoria Cross. The chestnut Mongolian mare, called Reckless, became the 68th animal to receive the PDSA Dickin Medal, the animal version of the Victoria Cross. The horse carried ammunition and wounded soldiers during the Korean War. Though wounded twice, Reckless lived until she was 20 and died in 1968. Under heavy bombardment she made 51 trips in a single day during the battle for Outpost Vegas in March 1953, according to official documents. In the five-day fight, 28 tons of bombs were reportedly dropped and the terrain was described by Lieutenant Colonel Andrew Geer as a 'smoking, death-pocked rubble'. The chestnut Mongolian mare named Reckless, bred as a racehorse’s journey with the US Marine Corps began in 1952 after she was bought for 250 US dollars. Soldiers nicknamed her Reckless because the gun she carried ammunition for - the Recoilless Rifle - was so dangerous it was coined the 'reckless' rifle. The horse was wounded in combat twice, given the battlefield rank of corporal in 1953, and then a battlefield promotion to sergeant in 1954, several months after the war ended. She was nominated by historian Robin Hutton who spent six years researching and writing a biography about her. Her relationship with the soldiers underscores the vital role of animals in war, not just for their prowess and strength in battle, but for the support and camaraderie they provide to their fellow troops. Reckless is the 68th recipient of the medal, awarded by the PDSA veterinary charity and billed as the animal equivalent of the Victoria Cross — Britain's top award for military bravery. Maria Dickin, founder of animal charity the PDSA, established the Dickin Medal in 1943 for outstanding acts of bravery in war. Most have gone to homing pigeons. Around 37,000 US and 1,000 British soldiers died in the Korean War, which lasted from June 25 1950 to July 27 1953.